The Swingline ProStyle+ is a compact personal shredder with a separate credit card and DVD shredder and a long enough run time to handle big jobs at home, unfortunately, the small bin size makes it less than ideal for office use. Shredding documents that contain sensitive information like social security numbers and bank accounts is a habit everyone should pick up, and Swingline’s Prostyle+ shredder makes it easy to do it securely. The Prostyle+ features super cross-cut shredding, which means it’s more secure than your average strip shredder and boasts a separate shred slot for destroying your old credit cards, CDs, and DVDs. It’s great for handling big shred jobs at home, but the small bin size doesn’t make it a great fit for office use. We recently brought a Prostyle+ into our office to see if its performance actually matches the aesthetically-pleasing design that Swingline went with for this model. We looked at how effective it is at destroying important documents, how it handles jams, whether it can tackle junk mailers, and exactly how good it is at chewing up items like CDs and credit cards. Most shredders are pretty boring to look at, but Swingline managed to add some class to the Prostyle+ with the two-tone, glossy black and silver body. It’s also quite compact, measuring at 17 x 9 x 16 inches and weighing 20.5 pounds. If you want a shredder that’s both functional and attractive enough to keep next to your desk instead of under it, you won’t find much better. The only real issue is that the glossy black finish acts as a powerful magnet for dust, lint, and especially the fine paper particles that are likely to escape into the air every time you empty the collection bin. If you want a shredder that’s both functional and attractive enough to keep next to your desk instead of under it, you won’t find much better. The Swingline Prostyle+ has one of the easier setup processes that you’re likely to ever run into. It’s literally ready to go right out of the box though you may want to leave on the protective cling film because of the aforementioned dust issue. The Swingline Prostyle+ offers a decent combination of speed, efficiency, and security. It’s rated to shred 14 sheets at a time, chewing through paper with impressive speed. In terms of shred size, the Prostyle+ is a cross-cut shredder. That means instead of just turning papers into long strips, it cuts them horizontally to create much shorter strands. The shred size measures at 5/32 inches wide and 15/32 inches long. That’s a nice small size for a cross-cut shredder, which makes it well suited to most home and home office settings, but not secure enough for medical or government use. There’s some contradictory information about the duty cycle (how long you can use the shredder before it needs a break). The manual says it can only run for three-minute sessions, with 30-minute breaks, but Swingline states in the online literature that the unit is capable of shredding for much longer 20-minute sessions with 15-minute breaks. In our testing, the Swingline Prostyle+ showed no signs of overheating even when approaching the 20-minute mark. But take this with a caveat because you’ll usually end up filling the collection bin at least once before you hit 20 minutes of continuous shredding. Fortunately, your shredding will be smooth because the Prostyle+ is rated to handle small paperclips and staples, and showed no signs of jamming when subjected to these materials during our tests. Swingline recommends you avoid running laminated objects through, which should also rule out tape, but we didn’t experience any problems when shredding junk mail that included see-through windows on envelopes. For your peace of mind, the Prostyle+ features Swingline’s “Non-stop Jam Free” technology. When the shredder detects an impending jam, it stops shredding and automatically reverses the operation of the feeding mechanism. You can also manually use the forward and reverse buttons to knock the jam loose. The Swingline Prostyle+ has a five-gallon bin that plenty big enough for occasional use, but fills up pretty quick when you have a lot of documents to shred at once. Swingline advertises a 20-minute run time, but the fact is that the bin is ready to empty well before you even hit the 10-minute mark. 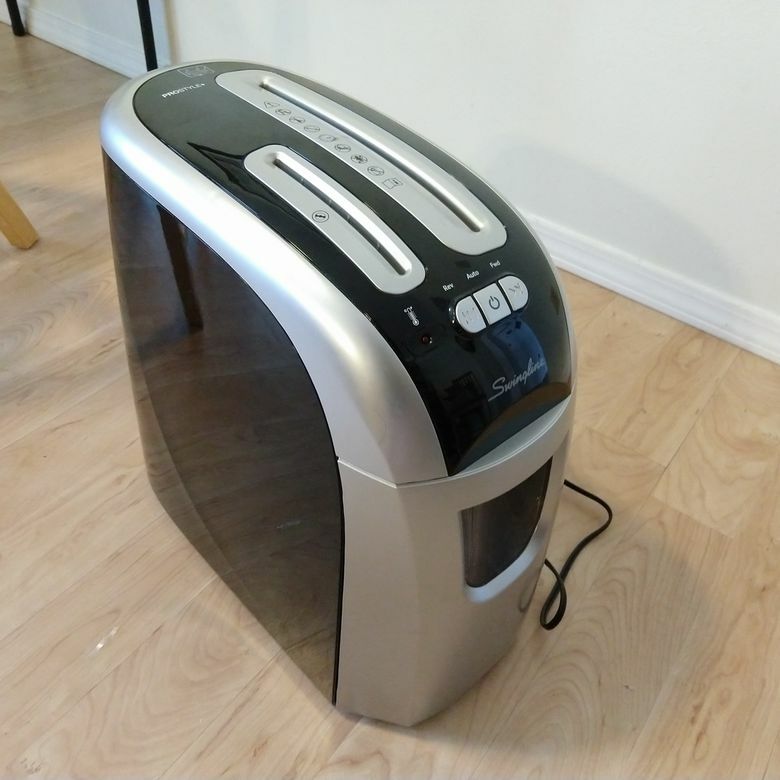 The size makes the shredder fine for most home, home office, and small office use, but don’t expect to sit down for a solid 20 minutes of shredding without stopping to empty the bin multiple times. On the plus side, when it is time to empty the bin it’s very easy to pop out with one hand. The bin is also small enough that it’s easy to handle even if you wait to empty it until it’s completely full. Cross-cut shreds don’t compact in the bin as tightly as micro-cut shreds. The collection bin also has a smaller container inside, which you can snap in place beneath the disc shredder so your destroyed CDs and DVDs don’t end up mixed in with your recyclable paper shreds. Unlike most shredders, the Prostyle+ is two shredders in one. The main shredder is primarily for paper, while the second shredder is specifically for optical media like CDs and DVDs, and it even has his own little tray inside the collection bin. The argument in favor of this configuration is that it allows you to shred optical discs without dulling the blades of your main shredder. The downside is that instead of being cross-cut, discs placed into this additional slot are cut into large chunks, making it insecure for credit cards. The Prostyle+ features the super cross-cut shredding style, which means it’s more secure than your average strip shredder. Credit cards we shredded in this slot were left largely intact, to the point it was extremely easy to piece them back together and read the numbers. If you plan to shred credit cards, make sure to insert them into the main cross-cut shredder. We measured the Swingline Prostyle+’s noise output at 65 decibels, which is marginally quieter than the similarly priced AmazonBasics 12-Sheet Micro-Cut shredder that we also tested. However, the sound that the Prostyle+ makes during operation is pitched higher than other shredders, making it seem a little louder than it really is. If you’re sensitive to higher pitch noises, this could be a turnoff. The Prostyle+ is priced competitively; though it’s slightly more expensive than some of its cross-cut and super cross-cut competitors, what you’re paying for is speed, longer duty cycle, and the impressively compact size of the unit. That said, the $99.99 AmazonBasics 12-Sheet Micro Cut shredder has the Prostyle+ beat in both price and security. While it compares favorably to the competition in terms of style, speed, and duty cycle, it’s important to keep in mind the Prostyle+ is only a cross-cut shredder. If you value security over factors like aesthetics and speed, then you can actually find micro-cut shredders in this same price range. The aforementioned AmazonBasics 12-sheet is one option that provides a much smaller shred at a slightly lower price, with the tradeoff that it’s a bigger shredder with a shorter run time. Another comparable unit is the AmazonBasics 15-Sheet Cross-Cut Shredder, which matches the 20 minutes run time of the Prostyle+ and has a similar level of security. However, it’s still a physically bigger shredder that doesn’t look as nice. Want to take a look at other options before you buy? Read through our list of the best paper shredders available now. Great performance and stylish design make this a worthwhile buy. The compact size of Swingline’s Prostyle+ shredder is both one of its biggest strengths and one of its biggest downfalls. It has an impressive 20-minute duty cycle if you go by Swingline’s online literature and our testing, but its compact size and small bin will keep you from really seeing the full benefit of that. This makes the Prostyle+ a better choice for home and personal use, rather than something that will satisfy office needs. Product Dimensions 24.5 x 14 x 5 in.